One of the main tasks of a student pastor is partnering with parents. We are not called to take the place of the parents, but to help the parents fulfill their God-given task at pointing their child to Jesus. So in the student ministry world there is a lot of talk about how student pastors can effectively partner with parents. But what about the parents partnering with us? How can parents come along side us and support what we are doing with their student. Recently Todd Iannetta, the head student ministries pastor at my church, shared seven ways parents can partner with student ministries. I would encourage you to push these out to the parents in your ministry so they can have some practical ways to jump on board what you are trying to do in the life’s of students. 2. If you have a problem, concern, question, or issue with anything we do, come to us first! Please don;t start going to other parents. If we don’t know we can’t help. 3. We want to help start spiritual conversations at home so don’t be afraid to ask what went on at one of our gatherings or small groups. Dialogue with your student and generate spiritual discussion. Don’t let them off easy. 4. Know the purpose of each event and help us communicate that to your student. 5. Actively pray for our student ministry, the staff, and the students. 6. Join our leadership team for the right reasons. Don’t join if you just want to keep an eye on your son or daughter. Join because you love Jesus, our ministry, and students. 7. Make student ministries a priority because it has the potential to be a powerful impact on your student’s spiritual life. Plan ahead so that conflicts don’t arise. Parents are the number one influence in student’s lifes. We want to do our best at partnering with them, but also welcome their partnership and support to our ministries. Interesting perspective. 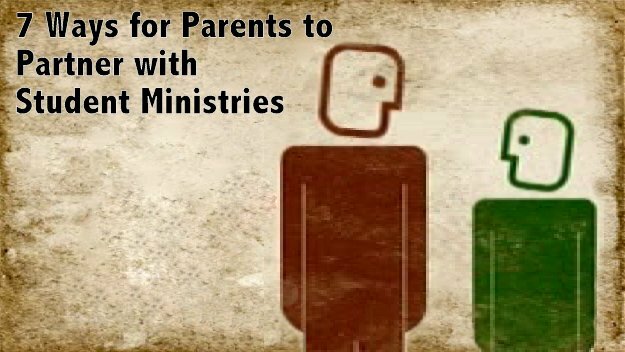 I’d usually thought of youth ministry as partnering with parents. Thanks for stopping by and leaving a comment. I don’t think we can ever forget and do away with partnering with parents. They are the given the responsibility from God to disciple their children. But I think as we partner with them, there are some practical ways they can partner with us in what we are doing. Reblogged this on …Seeking a Generation…. This is some amazing information. That Todd guy seems like a great dude. Thanks for sharing! I am pushing this out to my parents this week! Glad you found this helpful. Hope your parents find them helpful as well. Thanks!